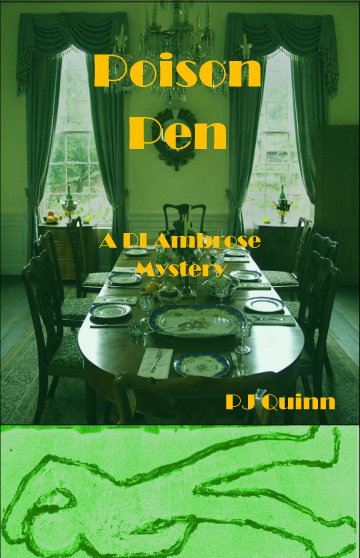 This charming sequel to PJ Quinn’s first DI Ambrose Mystery, Poison Pen, takes Ambrose under cover at a writers’ retreat in Chalk Heath to determine the circumstances leading to a suspicious death on an Indian railway train. This DI Ambrose mystery, the second of three tales of murder most foul begins on a train in India and continues back in sleepy Chalk Heath, the patch of DI Paul Ambrose. This novel is the second cooperation by mother daughter duo Pauline Kirk and Jo Summers writing as PJ Quinn. This charming sequel to PJ Quinn’s first DI Ambrose Mystery, Poison Pen, takes DI Ambrose under cover at a writers’ retreat in Chalk Heath, to determine the circumstances leading to a suspicious death on an Indian railway train. This retreat is not only a challenge to Ambrose’s investigative skills but to his cullinary and writing skills too; Ambrose is also kept busy avoiding low beams and unwanted amorous attention. This novel features Ambrose’s team of detectives including DS Winters and WPC Meadows, both of whom are establishing their own following.